Jeremy Bloom leads Albany team to open procession of athletes. 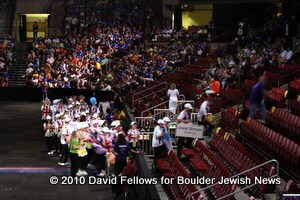 The opening ceremonies for the 2010 Denver JCC Maccabi Games rocked the house at Magness Arena on the DU campus Sunday night. Just like a regular Olympics, most of the first hour was taken up with the parade of athletes, led by former Olympian Jeremy Bloom, as visiting teams from Albany to York, plus Israel and the 300+ kids from Denver/Boulder paraded around the arena and into their seats. 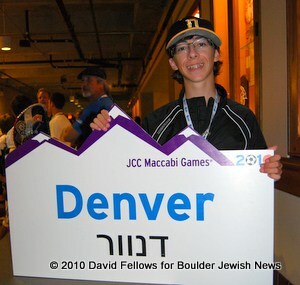 Team Denver was led in by Boulder athlete and professional sign holder Ethan Fellows (see him on weekends on Pearl St. with the CeFiori sign). 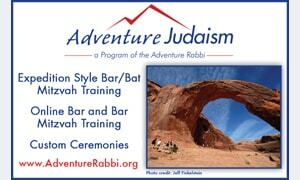 Many visiting and local dignataries were introduced, and Rabbi Bernard Gerson led the audience in a Shehechiyanu prayer. 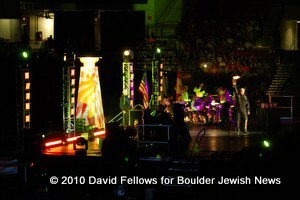 The anthems of the United States, Canada and Israel were played by the Denver Brass Ceremonial Ensemble, and oaths were administered to the athletes, coaches and spectators. This was followed by a moving tribute to the Munich 11 — the Israeli athletes and coaches murdered by terrorists at the 1972 Olympics. 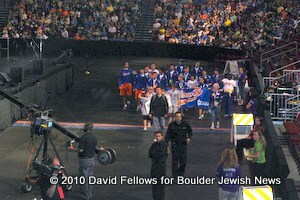 Then, while the Denver Brass Ceremonial Ensemble played an original Fanfare, “Tekiah,” written for these Denver JCC Maccabi Games, the JCC Maccabi flame was paraded around the arena and then used to light the cauldron to officially open the Games. 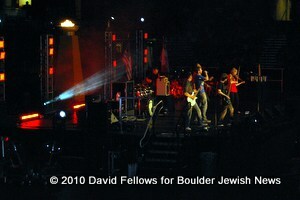 The event wrapped up with a surprise performance by Denver’s own Flobots. 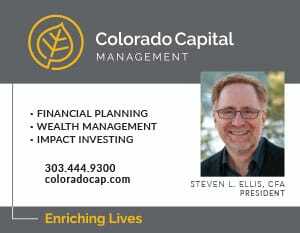 The Games themselves begin at 8 am Monday morning at venues all over Denver. More photos and video will be posted on Monday. Denver's Flobots close the show.